Why do I have the sudden urge to play a JRPG? The prologue scene opens with a shot of an archer heroine and her party of companions. An army marches below. The opening theme gives us a glimpse of all of the characters, telling a story with instrumental music without lyrics. Something about it reminded me of the opening to Final Fantasy Tactics. Maybe it was the music style. 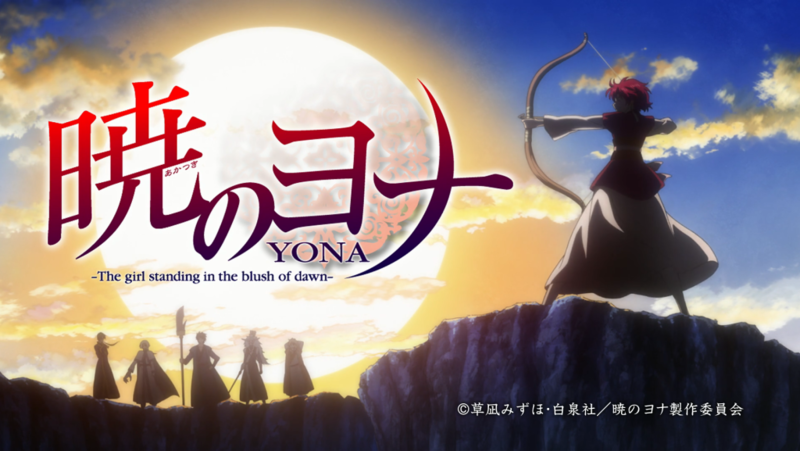 Yona narrates the opening scene of the first act in a way that tells the audience that this episode is in the past. We get a lovely view of the Kingdom of Kouka and Hiryuu Castle, where she used to live with her father. There is no queen and no male heir. The nearly sixteen year old Princess Yona fusses over her clothes and hair, while her father heads a ceremony that she was supposed to appear in. 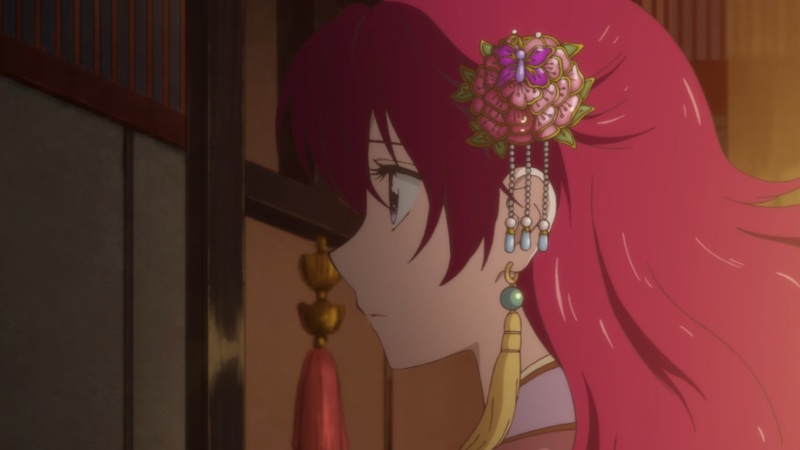 She misses the entire event, establishing Yona as a princess, spoiled and sheltered. Her biggest concerns in life are her unruly hair and her infatuation with her older cousin, Soo-Won. Spoiled, sheltered, shallow, selfish princess as the protagonist? What could go wrong? 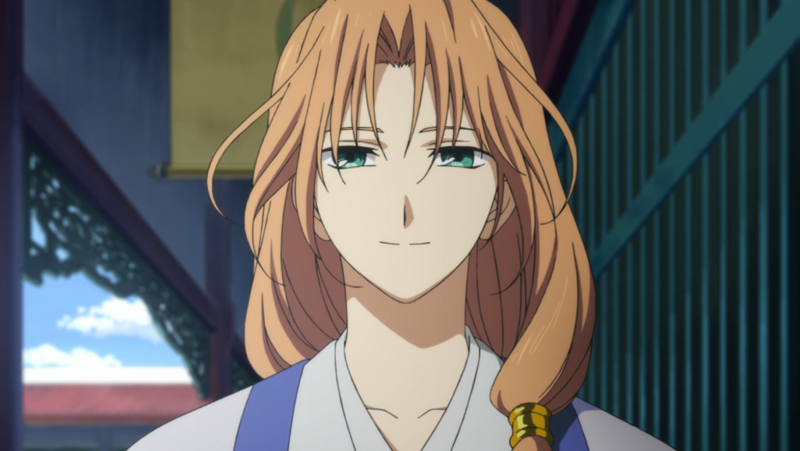 We’re also introduced to the sharp-tongued man from the Wind-Tribe, Hak, who is one of the five generals that protects the castle. There’s a little verbal sparring that seems unusual for a servant to engage in. When Yona hears that Soo-Won, has arrived, she bolts out to meet him. We spend some time illustrating Soo-Won’s kindness toward Yona after the queen’s death. Yona was infatuated with him ever after. However, Soo-Won treats Yona like a child. We also get to see some of the friendship between Hak and Soo-Won. Yona and Soo-Won talk about non-existing engagements, while on Soo-Won’s horse. Yona is so sheltered that the only name she can offer as a potential suitor to make Soo-Won jealous is Hak. Later that day, the king forbids Yona to pursue Soo-Won. The man who marries her will be the next king. That evening, while Yona is sulking outside her door, there is someone creeping about the castle. He chases after Yona and she runs to Soo-Won’s room. She realizes that a castle guard would have said something to her, instead of following her silently. While in Soo-Won’s room, Yona begins to declare her love for him. He does his best to ignore and deflect Yona’s declarations, eventually rebuffing her. He doesn’t seem to know how to deal with this. Meanwhile, the stalker is standing outside the door in the shadows. 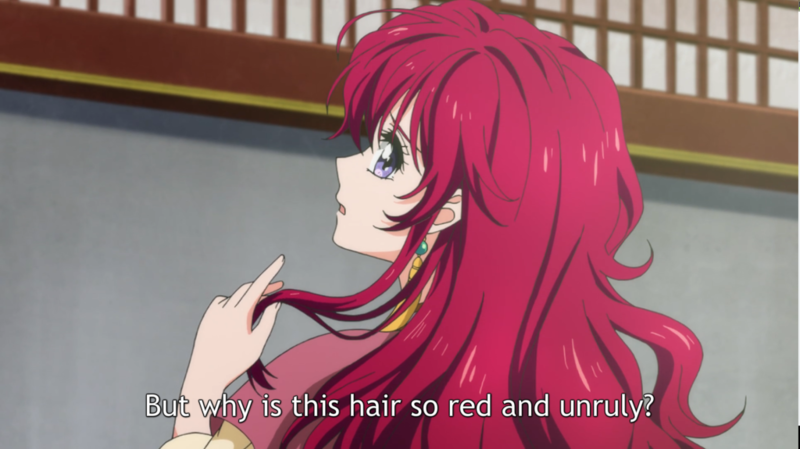 On Yona’s sixteenth birthday, she complains to her father about her unruly hair again. Spotting Soo-Won, she drops the conversation and runs off to him. He takes her outside to give her a hair ornament. Soo-Won tells her that he loves her hair, red like the sky at dawn, and she suddenly shifts to love her own hair. Hak interrupts, speaking to Soo-Won formally. Soo-Won tells him to call him by his name, like before. Hak tells him that something feels off about the castle. Something has made its way in. Soo-Won tells him that Yona said something similar. They should increase the guard. Dark lighting and sudden rainstorm? I’m sure everything is fine. That evening, Yona goes to talk to her father about Soo-Won again. The guards are not at his door. Yona notices this and becomes afraid, but goes in anyways. Inside, her father is killed by Soo-Won. Yona tries to run, but the guards surround her and are about to kill her. 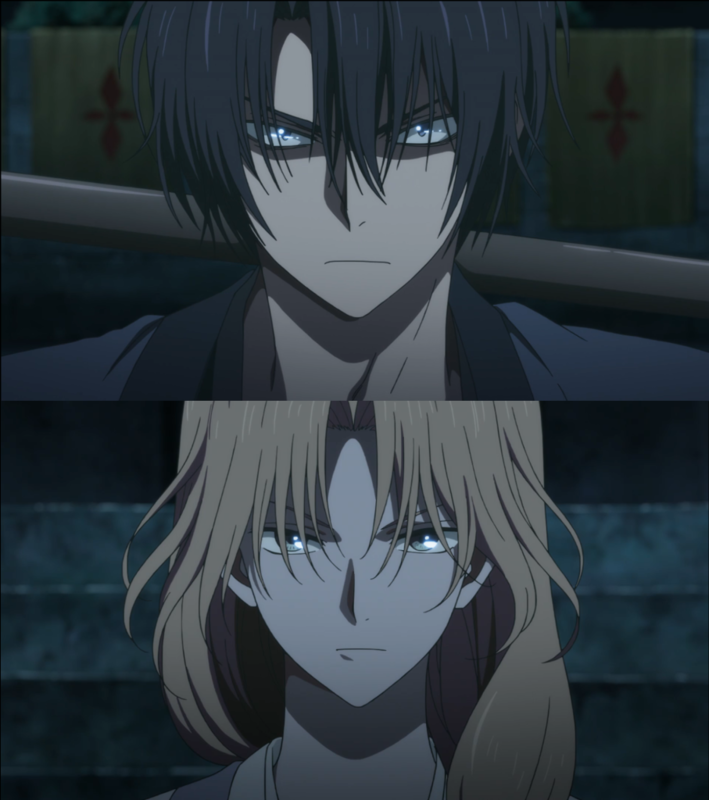 Before the final blow can be struck, Hak comes to the rescue and defeats all of them quickly. We end with a staredown between Hak and Soo-Won, both sporting the killer’s eye gleam. Starting the episode with a glimpse of who Yona will become helps deal with the spoiled princess phase we’re shown. However, I couldn’t help but think of another red-haired princess that blows off a ceremony she was supposed to be in. (Ariel from The Little Mermaid) I doubt that was intended. Yona’s thing for her cousin surprisingly didn’t bother me. Historically, royals marrying their first cousin was a thing that was done. The execution of Yona’s infatuation is done is such a way that it avoids crossing the creepy barrier and comes across as a sheltered girl’s infatuation. I don’t fault Soo-Won treating Yona like a child. She does act like a child through much of this episode. One point I found interesting was when the king forbids Yona to pursue Soo-Won, he says that the man who marries her will be the next king. That’s an interesting reason to give. Does he not want Soo-Won to be king? Does he already know something about Soo-Won’s intentions? Also, damn, is Soo-Won pretty. Girly pretty. Unfortunately, that made him the obvious villain and killed the twist, despite the great efforts to show him as kind. Soo-Won is sporting the anime mom look here. I like that we’re shown that Yona does think about things and puts pieces together. She does notice her environment, so she’s not a complete airhead. When she sees guards missing, she gets worried and frightened. We’re given a foundation for her character to grow from. As a side note, the lack of formality in castle reinforces the idea that this is a tiny kingdom where everyone knows each other. Yona probably does know all of the guards and servants. The art quality tells me that the producers have high expectations for this show and are willing to put some expense into it. Environments are detailed, the colors are bright and rich without being painful. On a personal note, I like the cast-out princess story type. Someone who is naive and sheltered is tossed out into the world and learns and grows. It was a major theme in an aborted novel I co-wrote years ago. Will we see the soft power vs. hard power dichotomy? I doubt it, but it’s nice to hope. As a bit of trivia, this was originally a shoujo manga by Mizuho Kusanagi that is still ongoing. Mizuho Kusanagi also wrote NG Life and Mugen Spiral, both fantasy/supernatural romances. 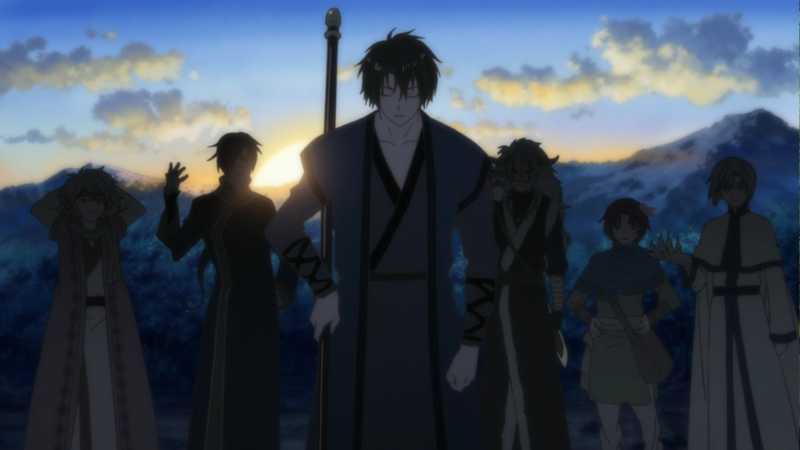 For a first episode, Akatsuki no Yona is solid. It introduces the lead characters, sets the scene, and assures the audience that there will be a character growth arc. This is going on my watch list this season. 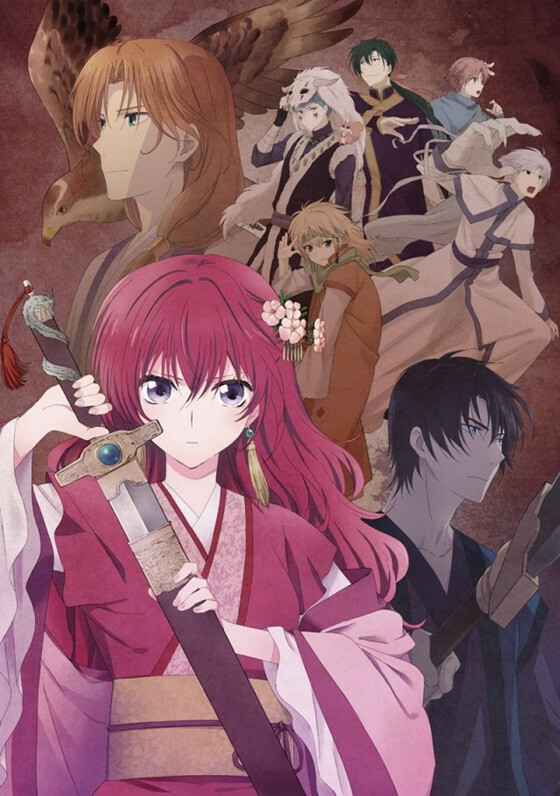 This entry was posted in Anime Reviews and tagged akatsuki no yona, anime review by Briarhenge. Bookmark the permalink.